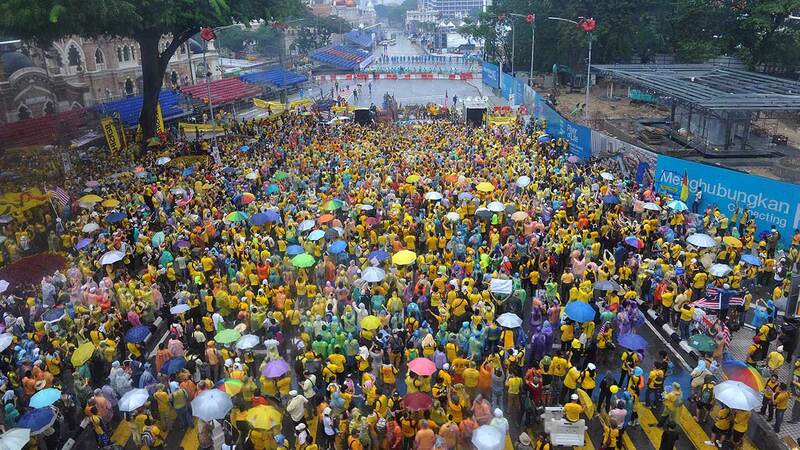 Malaysian protesters gather in the rain during a rally in Kuala Lumpur, Malaysia on Sunday, Aug. 30, 2015. KUALA LUMPUR, Malaysia -- Embattled Malaysian Prime Minister Najib Razak poured scorn Sunday on a huge two-day rally that brought together tens of thousands of yellow-shirted protesters demanding his resignation over a financial scandal. Large crowd of protesters camped overnight on the streets of Kuala Lumpur wearing yellow shirts of the Bersih movement - a coalition for clean and fair elections - even after authorities blocked the organizer's website and banned yellow attire and the group's logo. Former Prime Minister Mahathir Mohamad, who has been spearheading calls for Najib's resignation, made appeared at the rally with his wife for a second day, telling protesters that people power was needed to remove Najib and return the rule of law. Najib has been fighting for political survival after leaked documents in July showed he received some $700 million in his private accounts from entities linked to indebted state fund 1MDB. He later said the money was a donation from the Middle East, fired his critical deputy and four other Cabinet members as well as the attorney general investigating him. Najibhas slammed the protests for tarnishing Malaysia's image, and dismissed their size. Najib also vowed not to bow to pressure. "Once the sails have been set, once the anchor has been raised, the captain and his crew would never change course," he said. The rally was peaceful Saturday and was scheduled to last until midnight Sunday to usher in Malaysia's 58th National Day. Scores of police barricaded roads leading to the Independence Square, a national landmark that authorities declared off-limits to protesters. Previous two Bersih rallies, in 2011 and 2012, were dispersed by police using tear gas and water cannons. Concerns over the political scandal partly contributed to the Malaysian currency plunging to a 17-year low beyond 4 ringgit to the dollar earlier this month.